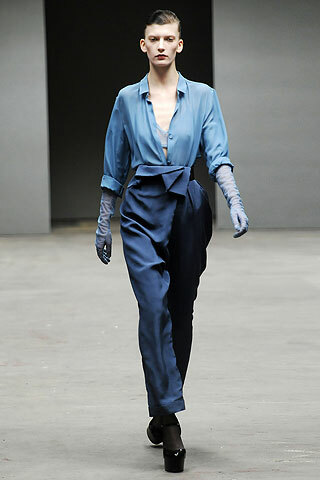 The Richard Nicoll collection was hauntingly beautiful. 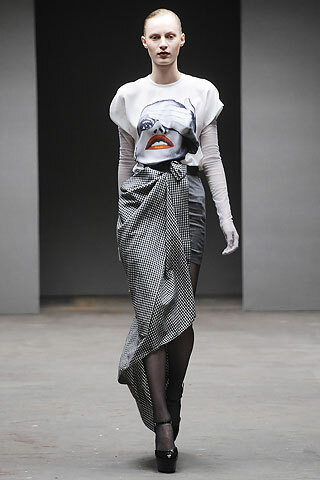 Love the oversized-graphic print tee worn with a wrap-skirt and, as is to be expected this season, epic long opera gloves. The best part about his show where all the amazing blue pieces he did. This little dress is equal parts dreamy and 80's working girl. SO GOOD! Kind of like a WWII factory worker gone completely fabulous. All the shades of blue look great together, but the best part is the most subtle and it's the fact that the sheer gloves match the wisp of bra you can see under the shirt. This, this is THE LOOK. Sheer t-shirt and velvet skirt cut up-t0-there. This is my everything right here. What is the name of the t-shirt of the first picture? I've seen that image before and I want to make a t-shirt with that picture my own.